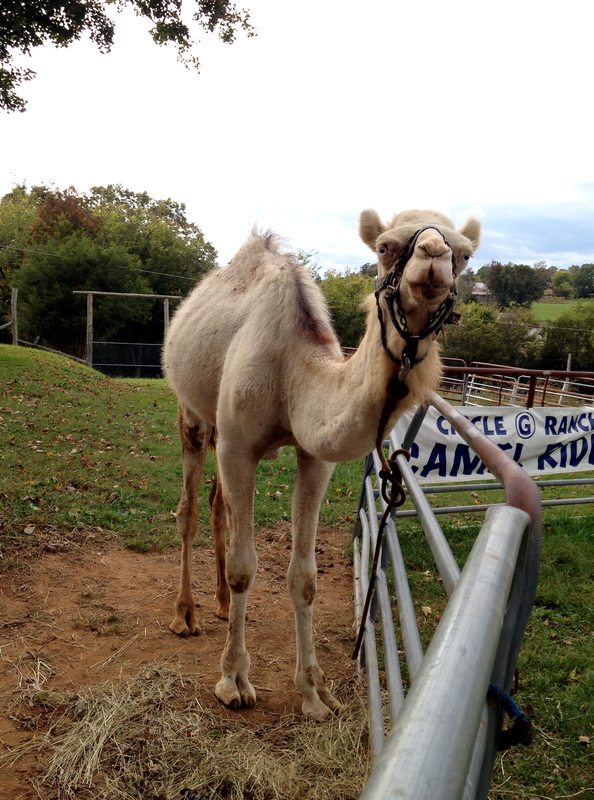 After another long hiatus from the blog, a few weekends ago I crossed something off of my list I have wanted to do for a while: going to a drive-through petting zoo and riding a camel. My friend Amy (from belly dancing, rock climbing, the aerial fitness class, and several other posts) joined me for the day. 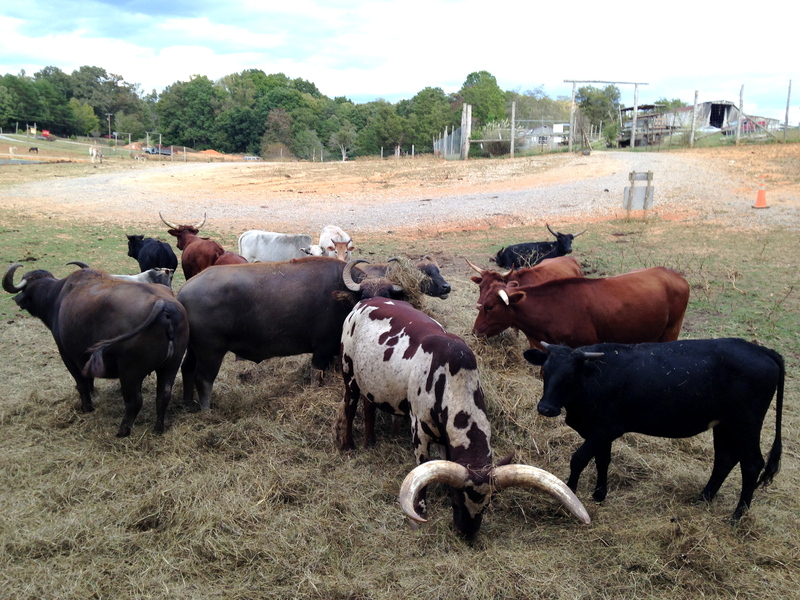 The 100-acre Circle G Ranch is just north of Knoxville and is home to 500 animals (30+ different species). 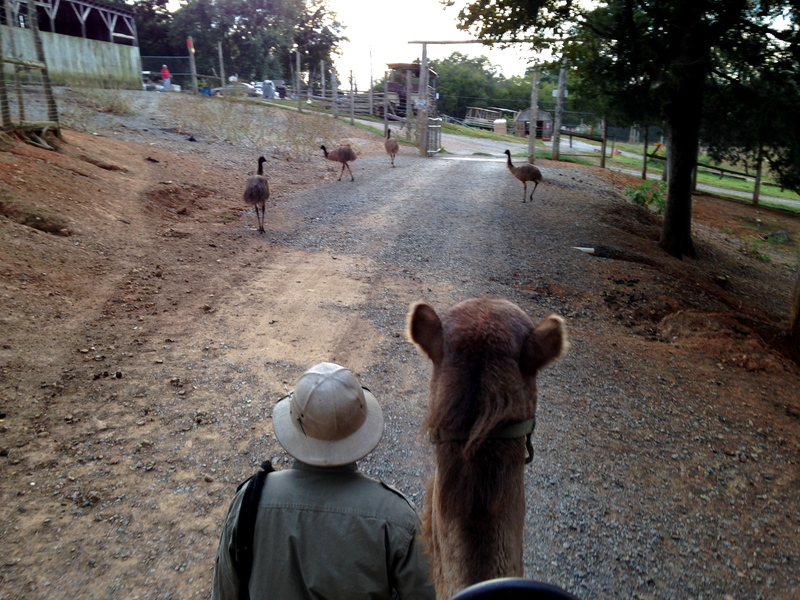 When we got there they were still saddling up the camels so we took a drive through the park while we waited. We bought a few buckets of food for the animals so we could have an up-close-and-personal experience. When we started the trip around the park we leisurely passed some zebras, llamas, and alpacas (yes, like the sweater). I thought it was going to be a pretty uneventful drive. 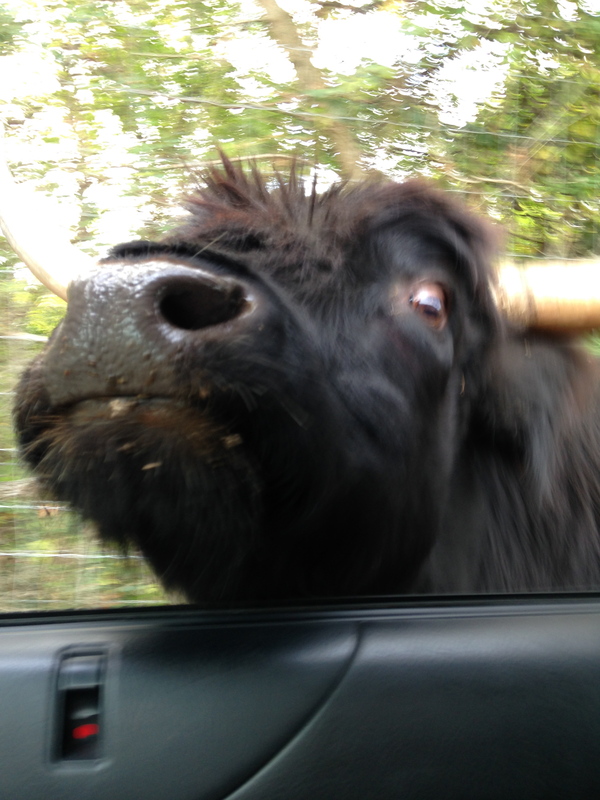 However, upon rounding a corner we came across a herd of longhorns, water buffalo, and highland cows. They were really excited to see us. It turns out the highland cow was the least of my concerns. 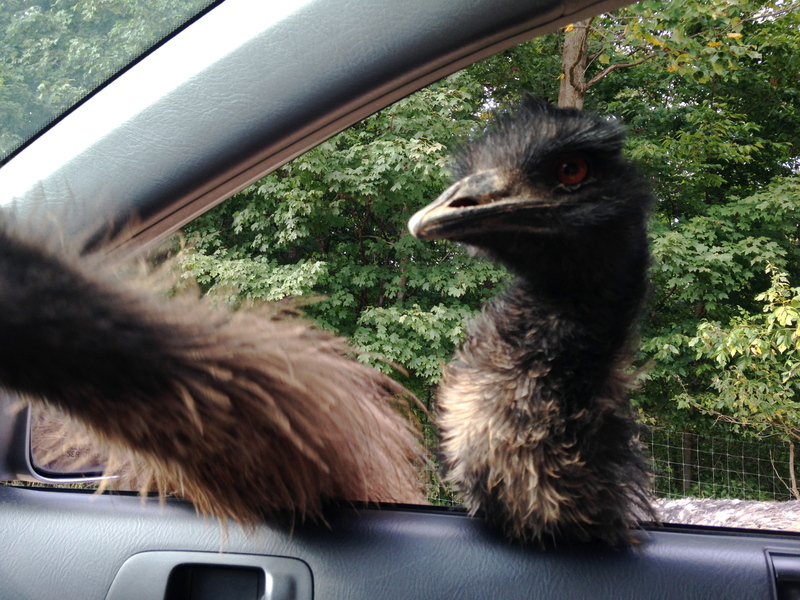 I soon discovered the waking nightmare that is the emu. They are terrifying. They are like small feathered velociraptors with long necks and soulless red eyes. You couldn’t look away, even for a second, because as soon as you did they would multiply in number. At one point three of them had their heads in the car. One even stole some food right out of Amy’s lap. There may or may not have been a lot of screaming involved. 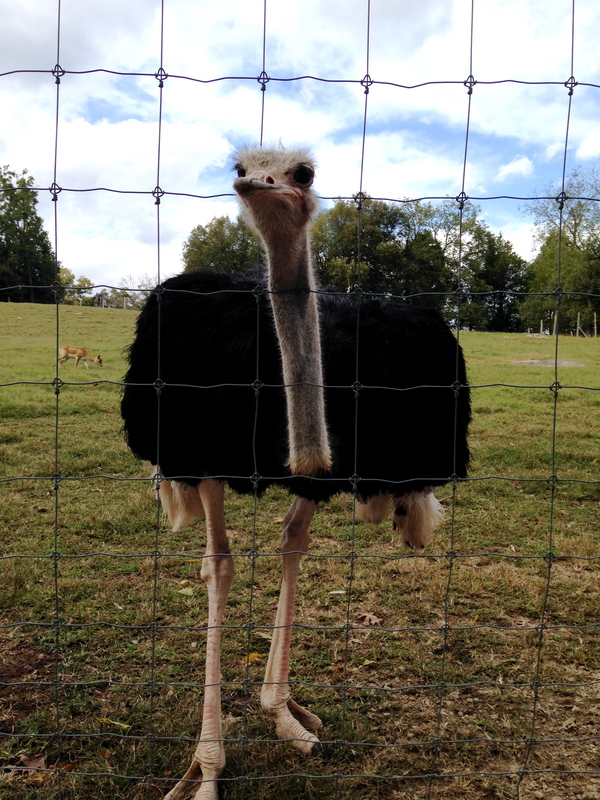 After the run-in with the emus I was quite glad to see the ostrich behind a fence. It made Big Bird look small in stature. They can grow up to 9 feet tall. Not all of the animals were terrifying. The barbary sheep were absolutely beautiful, though there were so many of them in the herd they created a bit of a road block. 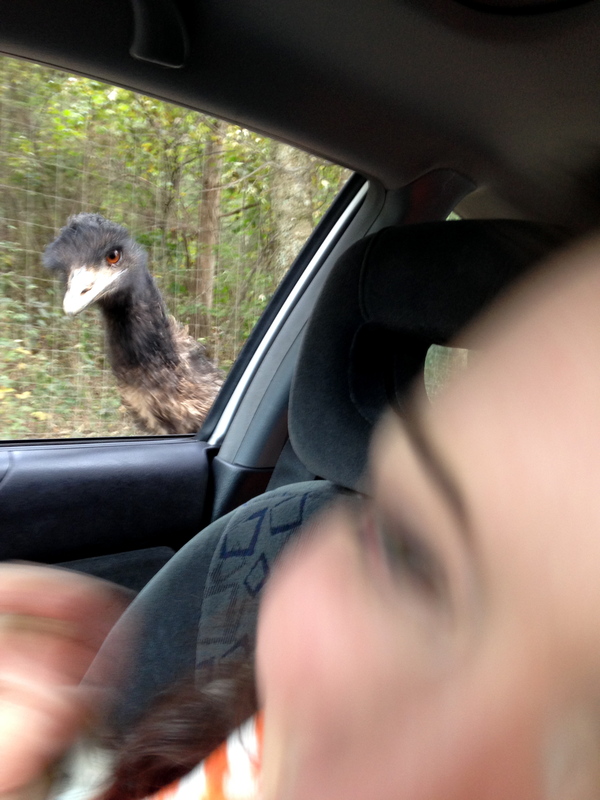 We had to distract them with food to get them out of the way of the car. 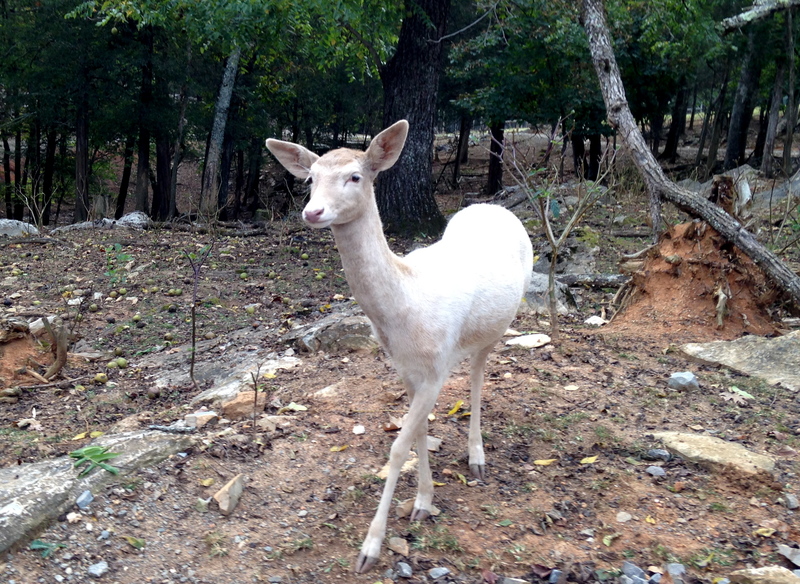 We also saw several fallow dear. They had gorgeous white cream colored coats with spots on their back; a bit different than the ones you see in your backyard. 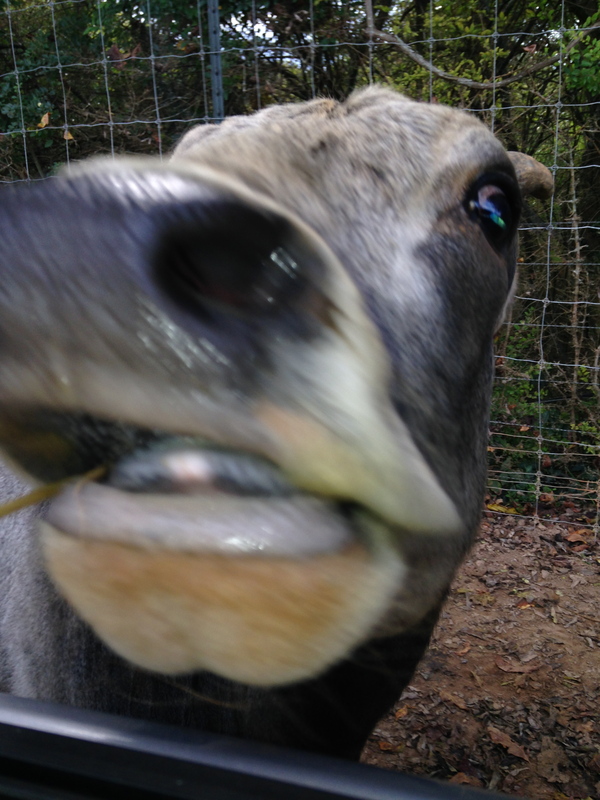 There were of course also some very curious farm animals. 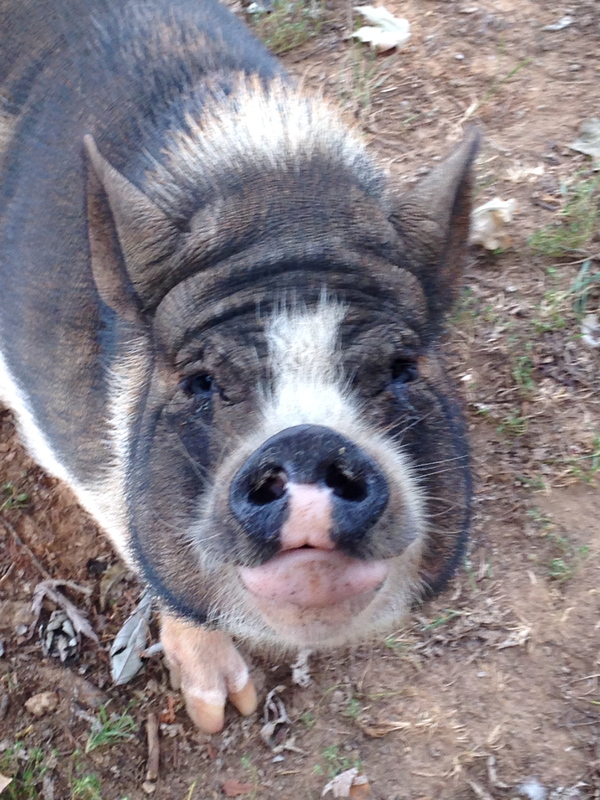 This little piggy just had to come say hello. There were dozens of adorable piglets running around too. 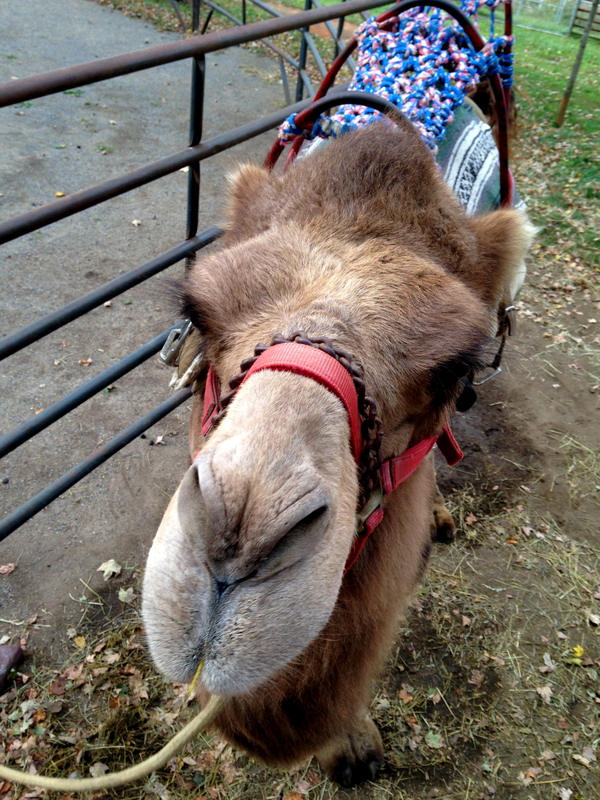 Is it just me, or does this camel look like Don Knotts? After our drive, we saddled up for a ride around the park. This one, above, kept trying to make a meal out of my arm. Apparently I looked tasty. We took the same path as we did in the car and the entire trip took about an hour. It was a cool fall day, but fortunately we were still bundled up from a football game earlier that morning. Our guide told us all about the animals in the park, where they are from, what they eat, and how they care for them. A few of the animals are even endangered. It was a really relaxing ride. 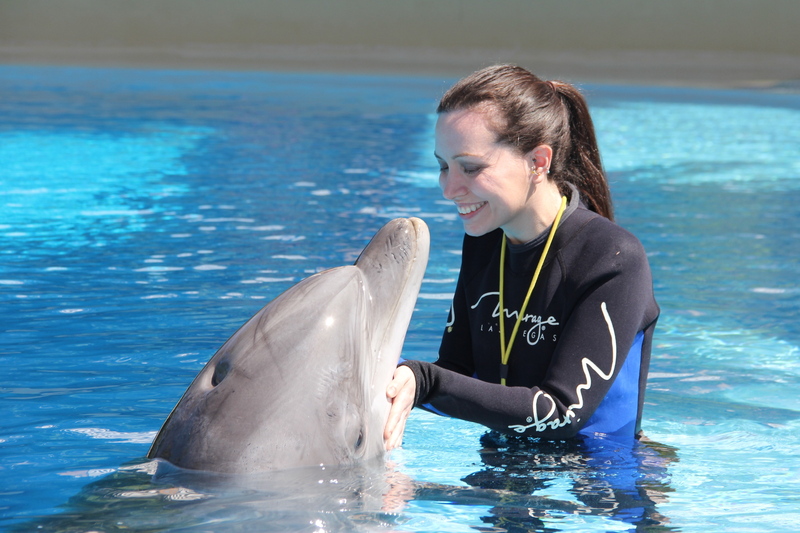 I should note that despite referring to several of the animals as “terrifying” we actually had a great time. 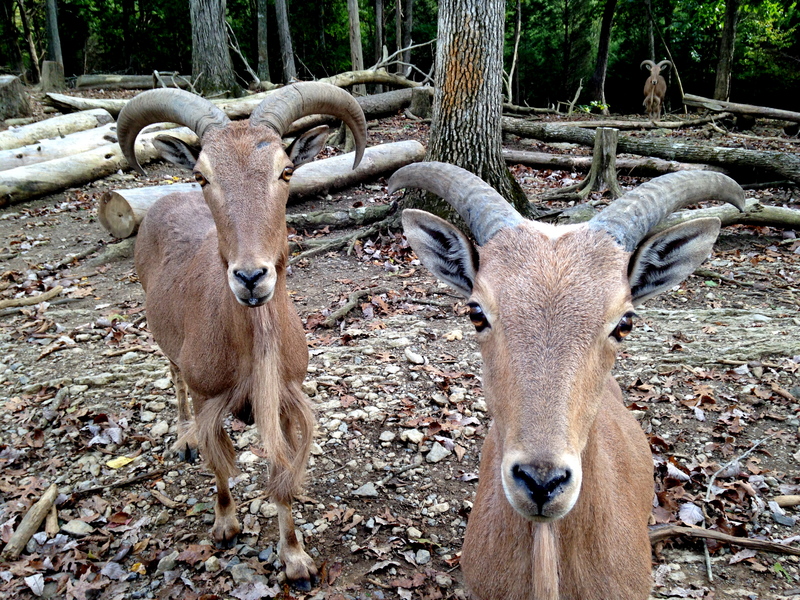 They weren’t really that scary … just “curious,” or so I am told. Apropos of nothing, while it doesn’t really qualify as something new, I wanted to share another image from my safari weekend. 102,455 Tennessee football fans (minus a few Florida fans) got together and made the coolest showing of school pride in the history of sports. We managed to turn Neyland Stadium into a giant checkerboard. We didn’t win the game, but getting to see this in person was still very special and something I will never forget. We should try to do this again sometime, eh? Absolutely loved this weeks adventure! The photos and comments were hilarous, nice job!! Thanks for sharing your experience. 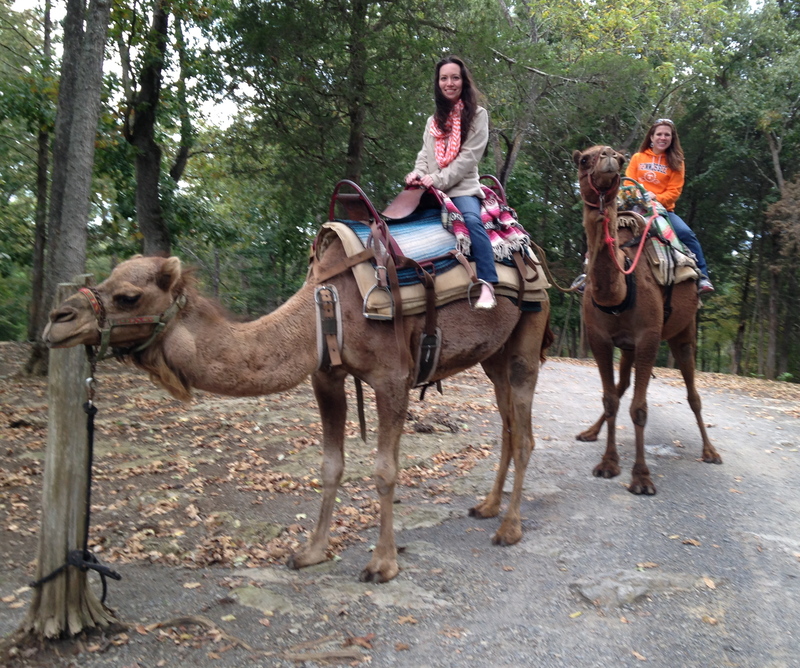 I’ve ridden an elephant before, but never a camel. I enjoyed your post very much. Your pictures wonderful! We loved this! You are such a great writer.